The Confederation of African Football (Caf) dismissed the Gambia Football Federation's (GFF) appeal over the eligibility of Togo defender Adewale Oloufade and upheld the original decision of its disciplinary board. Caf had dismissed the GFF's first protest which claimed the player, also known as James, is Nigerian and does not meet the necessary criteria to play for Togo. Olufade played for Togo as they drew 1-1 with The Gambia on 12 October in an Africa Cup of Nations qualifier. The original protest in October stated: "In the match form provided by Togo, his name is listed Adewale Olufade but in the Caf system he is registered as James Adewale Olufade and his date of birth as 21 August 1994." On Wednesday, Caf confirmed the outcome of the Gambian appeal, and said Olufade was eligible "to represent the Togo national team." The GFF reacted to the ruling with a brief statement, saying "we have consulted our lawyers for legal advice before our next line of action". 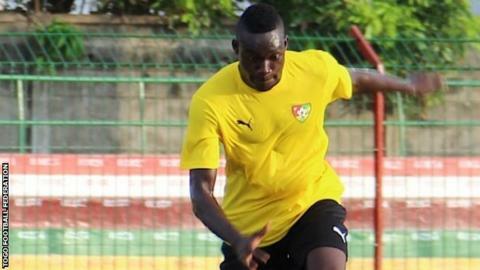 24-year-old Olufade has played club football in both Togo and Cameroon and made his international debut for Togo in a 0-0 draw with Benin in September. The Gambia are bottom of Group D of the Africa Cup of Nations qualifiers with Togo just above them thanks to a better head-to-head record. Both sides are on five points - two adrift of second placed Benin. Algeria have already qualified from the group. In the final round of Nations Cup qualifier in March, Benin host Togo while The Gambia travel to face Algeria.